Recently I heard some sort of public service announcement about energy usage. I don’t recall where I heard it, but I was struck by one part of it. Two kids were talking about energy usage, and one mentioned that your cell phone charger still draws power, even if your cell phone is not plugged in. That is, if you leave the charger plugged into the outlet when not charging, which many people do. I was very suspicious of this claim, so I decided to do a little test with my Sanyo S1 phone charger, and my kill a watt, which is a small device which measures energy usage. You simply plug the kill a watt into an outlet, and then plug a device into the kill a watt. I left my phone charger plugged in for 5 days without plugging in my phone. During this time, the killawatt reported 0.00 kilowatt hours of energy usage. This does not conclusively mean that it used no power. There is a precision limitation. If I left a charger in for a whole year, and it registered 0.00 killowatt hours, I would be confident that the charger draws at most 0.0099 kilowatt hours per year. Since I only left it in for five days, I have to imagine that it could use 0.0099 kilowatt hours per five days, which is 0.7227 kilowatt hours per year (.0099*(365/5)). In comparison, running a single 13 watt compact flourescent light bulb for 1 hour a day for a year uses 4.745 kilowatt hours of electricity (13*365/1000), or 6.5 times as much energy. In summary, does leaving your cell phone charger plugged in waste electricity? Maybe. 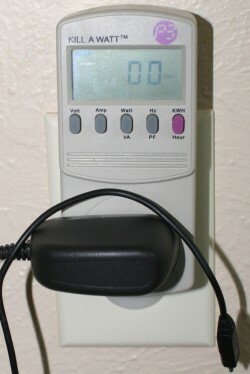 But in the case of my Sanyo S1 charger, it uses very little electricity. If you want to conserve electricity, you would be much more effective by turning off lights when you don’t need them. Another note – I have also tested out how much power my iPod Photo (circa 2005) uses. When plugged in all the time, it uses about 2-3 kilowatt hours per year. Once again, less than running a 13W bulb one hour a day. This entry was posted in environmentalism and tagged energy. Bookmark the permalink. maybe that happens with old equipment, i had a charger that used to get hot even when not charging. those energy meters are unreliable at low power usages.